Relationships of the heart can be a constant puzzle. 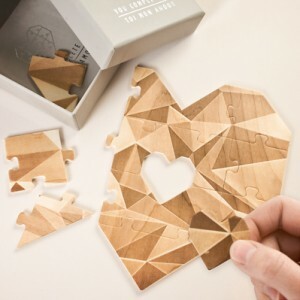 Make sure the one you love understands this sentiment by giving them one of these heart shaped jigsaw puzzles. Assuming this point goes right over their head, they’ll hopefully just see the heart and the personalised message you add to the back, and give you a kiss. This jigsaw is crafted from multi-coloured heat stamped wood and presented in a lovely box. Because nothing says “I love you” more than spending less than a tenner on cheap valentines gifts.